He was born in the Brownsville neighborhood of Brooklyn. His father was a traveling salesman. His mother worked in a chocolate factory. My father had to quit school in the ninth grade. He sold ice cream in a movie theater, balloons, and worked in a leather factory. He went into the Army during World War II. He was stationed in the U.S. and read at every opportunity. His first vote was for a Communist. After 1945 he got married and started to work for a hardware store under the banner of District 65 United Auto Workers union. A trade unionist for 30 years, he was never late for work. He demonstrated in 1944 to demand that the Allies open up the second front. He was at a concert by Paul Robeson in Peekskill, N.Y., which was attacked by a fascist mob. He collected signatures for Adlai Stevenson for president during the 1950s. He rallied against the Vietnam War. I remember accompanying him to a few such rallies. The FBI knocked on our family’s door, but fortunately he didn’t go to jail. He was a good dancer. He used to take us children with my mother Rose to Coney Island Beach. That was a good beach with the soothing ocean. He was a loving father and husband. He loved the feeling of music, especially the song “Brother can you spare a dime?” He never learned how to drive a car, but he could ride a bicycle. I think of him often. There are those among us Americans who want the total abolition of war and not just particular wars. Many Quakers and other good religious citizens traditionally antiwar feel it is time to renew the idea of perpetual peace, which the Bible says is meant to be — this noble and honorable goal. War and peace questions should not be decided by governments or politicians but by the entire people who have the most to lose in the final analysis. The world’s resources are finite and war is very wasteful and upsets the balance of nature. War distorts science, keeping higher benefits from millions. Your paper, People’s Weekly World, is helping lead to reasonable answers. Good luck to your continuing publishing. 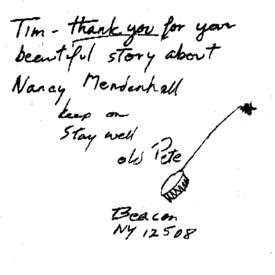 Thank you for your beautiful story about Nancy Mendenhall. (Review of “Orchards of Eden: White Bluffs on the Columbia, 1907-1943” PWW 6/3-9) Keep on. Stay well. For 35 years I have been associated with this newspaper. I distributed it to shipyard workers on strike against John and Joe Pew — now Kerr-McGee — when the newspaper was called The Daily Worker. It was a four-page tabloid then. In all those years I’ve seen things go up and down, I’ve seen the paper change too — from a daily to a weekly back to a daily and now a weekly. I’ve seen its name change a few times. But it is my great pleasure to say that I am so proud of this newspaper and how it is today. The newspaper has grown and surpassed all the previous editions. I’ve been particularly impressed with Dan Margolis’ articles, which have been excellent and authoritative. Then I see his photo in the paper and he’s a good looking guy! So many new things in the paper that are exciting, especially the reports about young people and the YCL. Last week I distributed about 35 papers in a local grocery store with the “$5.15 an hour won’t cut it” headline and people just grabbed them up. I told them it was the “Father’s Day” edition. I give $1,000 out of my Social Security check to this newspaper and ask people to subscribe and give. John Gilman is a highly-decorated WWII veteran and a peace activist. I’m a teacher in Los Angeles and am interested in establishing contact with any organization involved in teacher delegations to Cuba. Editor’s note: If any reader has information on education delegations to Cuba please e-mail it to pww@pww.org. It will be passed on and published in the Letters to the Editor column. Re: Sudan and Darfur (PWW 6/10-16). I understand as little (or nothing) about the cause(s) of the tragedies as I did before reading your double-page spread stating that “the problem is political.” The Communist Party leader and author merely states a conclusion in his first paragraph — I could not find a political analysis of the basic causes — only a call for a “dialogue” leading to a “peaceful and political” solution and what that solution would be like. There is a fleeting mention of oil, and the possibility of other resources in Darfur. But no facts and no analysis of the forces — domestic, foreign, class. And if “political,” what are the political issues and what are the material bases from which they arise?